Sandra's daughter, Natalie, is an assistant head teacher at Derwentwater Primary school in Acton. 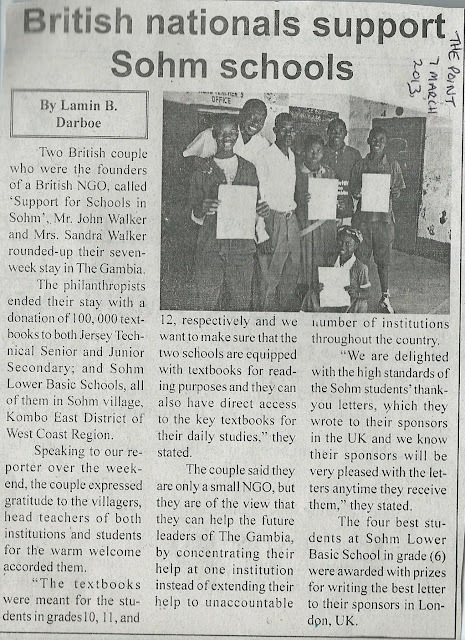 She spent the February half term in The Gambia, with her colleague, Nicola. The two of teachers provided whole day teacher training to all of the staff, in each of Sohm's two schools. They received an over 90% approval rating for their efforts, with the most common remark on the feedback form's being "Come back next year"! The heads of the two schools were delighted with their efforts and are confident that teaching performance in the schools will improve. Certificates of participation and attendance were presented to all those who attended the courses. The picture on the previous page shows Natalie and Nicola with the whole staff of the Lower Basic school, with their certificates. 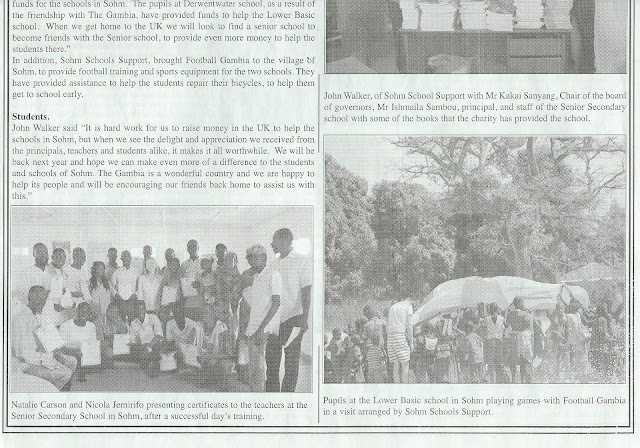 The Gambian government provide textbooks for pupils until the age of 12. After that age, students have to buy their own textbooks, or rely on sponsorship. A year ago there were very few books in the Sohm Senior Secondary school for the 180 years 10, 11 and 12 students (aged 15 - 19) and examination results were poor. 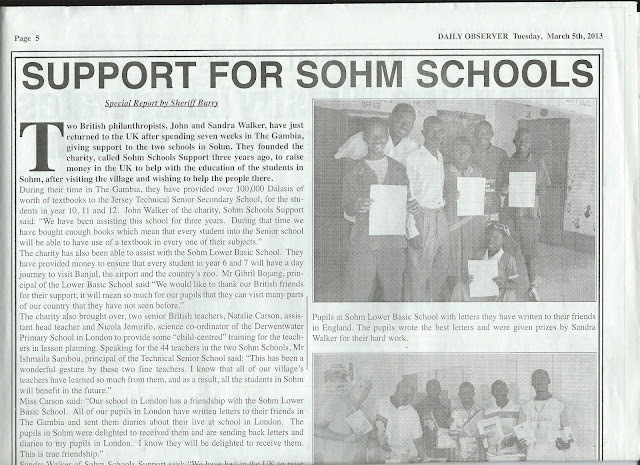 Sohm Schools Support has established a Book Fund over the last two years. As a result, there are now sufficient text books for these students, so that all of them are able to share a key set book (one book between two students) for each of the 15 subjects studied at this level. We look forward to greatly improved examination success! Students at each school have had lessons on the countries and life styles of their international friends. A talented artist in the village was keen to show Sohm's gratitude for the twinning and painted the Derwentwater logo on the wall outside Gibril Bojang - the Lower Basic school's head teacher's office. We'll be providing you with an update of this exiting occasion, in our next newsletter. We thought we'd just whet your appetite, now!! 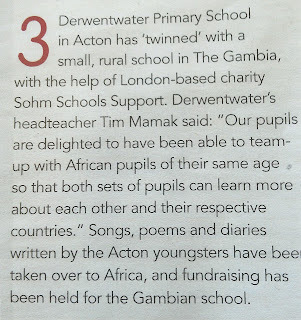 We have a presence on Facebook (SohmSchoolsSupport), Twitter (@GambiaSchools) and a website (www.sohmschoolssupport.org.uk), and can be contacted via e.mail at info@sohmschoolssupport.org.uk. Keep in touch and find out how we are getting on, and spending our income!